In our daily life, we take the shoes off when we entry our home and place it in hallway. Someone ask me whether it is good to place shoes in hallway. In Chinese the shoes’ pronunciation is‘Xie” with the same pronunciation of harmony in Chinese. Another reason is that we worn the shoes and went to many places with different feng shui energy outside. Once we went to some area with bad feng shui, you maybe bring those feng shui back to your home by your shoes. It will be better to take shoes off when you entry home and place them in hallway near the main door. So the answer is placing shoes in hallway complying feng shui rules. But there are some feng shui tips which need your attention. As we all know, the main door is the entry of feng shui energy Chi, so the hallway is the passage of feng shui energy flow. If we place many shoes or other things in hallway chaotically, it will block the feng shui energy. You must place your shoes in order. So the shoe cabinet is good choice for keeping your shoes in order and cleans. Here are some feng shui tips for shoes cabinet. The height of shoes cabinet shall be not too high or too low. If it is too high, it will be difficult to get your shoes and the high shoes cabinet also can block the feng shui energy chi flow. If it is too low, there is no enough space to storage your shoes. So the best height of shoes cabinet is about 1/3 height of room. Some feng shui masters believe that the height of room is divided into 3 sections. Top is heaven, middle session is Man and bottom is earth. Shoes shall keep at earth section. So the shoes rack’s height shall not beyond earth session. The lucky number of tiers is five which behalf of the Five Elements (Metal, Water, Wood, Fire & Earth) in the aspect of Feng Shui. Also the number of tiers shall less than 5. Also the actual number shall be determined by your shoes rack’s height. 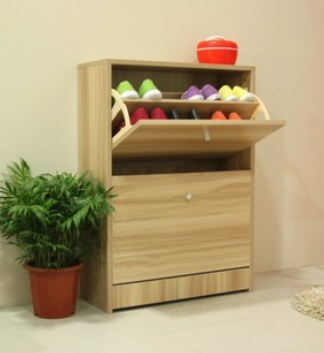 When you choice the shoes cabinet, you would better buy one enclosed cabinet with door. This door can help you to hidden chaotic situation and reduce the bad smell emission out of cabinet. Some nice cabinet with door also can become very good decoration in your home. When you place your shoes, pls ensure the shoes head face inward and downward instead of facing you when you take it out. Because some sharp shoes heads is signal of negative chi. Placing shoes head downward can help to sweat evaporate and keep the shoes dry. Placing shoes cabinet at sideway of hallway, do not place it in middle of hallway. Remember do not place shoes cabinet in bedroom. Keep your shoes and shoes cabinet clean. As we discussed the feng shui near main door and hallway is very important, so get positive feng shui energy at main door and hallway is very helpful. So try those feng shui tips to get better feng shui. GOOD LUCK! if you want to see more feng shui tips for shoes click here.